They said the sum contradicts Mt. 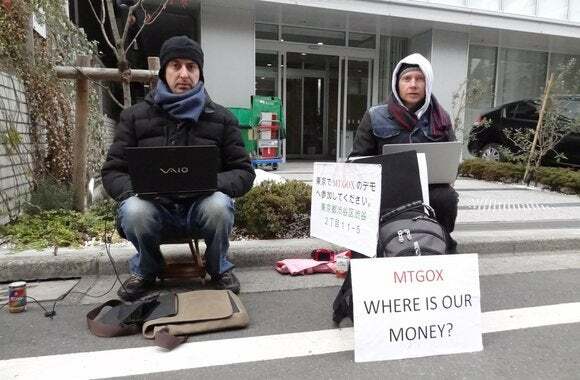 Gox’s claim in a Japanese bankruptcy protection filing Feb. 28 that it had lost about 850,000 bitcoins. 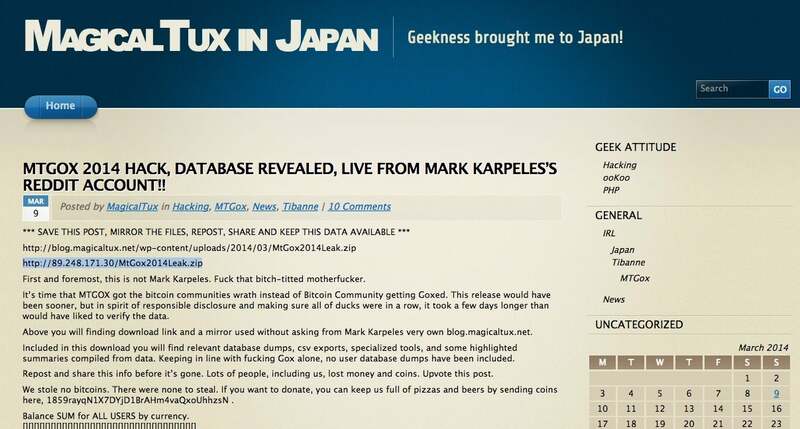 Karpeles’ blog was titled “Magical Tux in Japan—Geekness brought me to Japan!” Karpeles, who is French, often used the nickname “MagicalTux” when posting on public message or chat forums. His blog went offline on Sunday shortly after it was attacked. The attackers claim to have obtained database records containing transaction details from Mt. Gox. They wrote they purposely withheld users’ personal data. Mt. Gox had as many as 1 million customers as of December. The data included a screenshot of what appears to be an internal SQL database administration tool, Karpeles’ CV and a Windows executable called “TibanneBackOffice,” among many others. Mt. 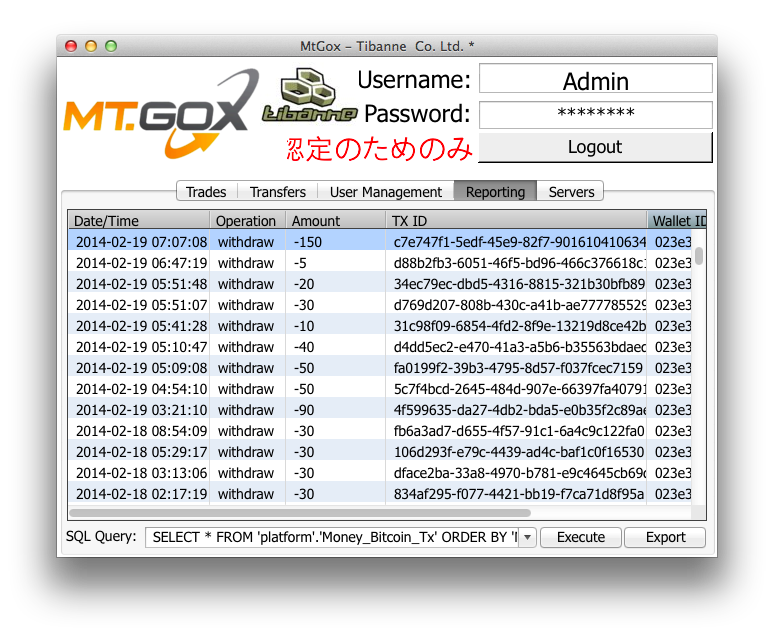 Gox is a subsidiary of Tibanne, a company owned by Karpeles. Mt. Gox’s demise has enraged its out-of-pocket customers as efforts continue to derive clues from bitcoin’s public ledger, called the blockchain, that might indicate the fate of its virtual currency holdings. One of the files released by hackers claiming to have compromised Mt. Gox is a screenshot of what appears to be a SQL database tool. The long-known security problem is being addressed by the custodians of bitcoin’s core software who’ve said it is usually only an issue if a bitcoin exchange has not coded its own software correctly. The blockchain records the movement of bitcoins from a user’s public bitcoin “address” or “wallet,” which is a 32-alphanumeric character. It is possible, for example, to attribute addresses to a person or company based on past transfers. Adam Levine, who writes a blog dedicated to bitcoin, investigated Mt. Gox’s bitcoin balances along with four colleagues. The group found two addresses, one with 90,000 bitcoins and another with 200,000, that may belong to Mt. Gox. The 850,000 bitcoins that were lost from Mt. Gox, 100,000 of which were its own, were worth an estimated $474 million. “There’s a lot of technical depth, but when it comes to attributing it to individuals, it’s very, very difficult, and it’s tempting to draw conclusions because sometimes it seems like it’s just obvious,” he said. The 850,000 bitcoins that were lost from Mt. Gox, 100,000 of which were its own, were worth an estimated $474 million. If stolen, the incident would be one of the largest cybercrime thefts on record. “For the thieves who used the more complex strategies, we saw little opportunity to track the flow of bitcoins (or at least do so with any confidence that ownership was staying the same), but for the thieves that did not there seemed to be ample opportunity to track the stolen money directly to an exchange,” they wrote. If that’s the case, it would appear by looking at the blockchain that Mt. Gox would still have bitcoins sitting in an address known to be under its control, but transferring the bitcoins is impossible.